Part of the constellation of Carina, Epsilon Carinae is an example of a double star featuring a main-sequence B-type star. A B-type main-sequence star (B V) is a main-sequence (hydrogen-burning) star of spectral type B and luminosity class V. These stars have from 2 to 16 times the mass of the Sun and surface temperatures between 10,000 and 30,000 K. B-type stars are extremely luminous and blue. Their spectra have neutral helium, which are most prominent at the B2 subclass, and moderate hydrogen lines. Examples include Regulus and Algol A. This class of stars was introduced with the Harvard sequence of stellar spectra and published in the Revised Harvard photometry catalogue. The definition of type B-type stars was the presence of non-ionized helium lines with the absence of singly ionized helium in the blue-violet portion of the spectrum. All of the spectral classes, including the B type, were subdivided with a numerical suffix that indicated the degree to which they approached the next classification. Thus B2 is 1/5 of the way from type B (or B0) to type A. Later, however, more refined spectra showed lines of ionized helium for stars of type B0. Likewise, A0 stars also show weak lines of non-ionized helium. Subsequent catalogues of stellar spectra classified the stars based on the strengths of absorption lines at specific frequencies, or by comparing the strengths of different lines. Thus, in the MK Classification system, the spectral class B0 has the line at wavelength 439 nm being stronger than the line at 420 nm. The Balmer series of hydrogen lines grows stronger through the B class, then peak at type A2. The lines of ionized silicon are used to determine the sub-class of the B-type stars, while magnesium lines are used to distinguish between the temperature classes. Type-B stars don't have a corona and lack a convection zone in their outer atmosphere. They have a higher mass loss rate than smaller stars such as the Sun, and their stellar wind has velocities of about 3,000 km/s. The energy generation in main-sequence B-type stars comes from the CNO cycle of thermonuclear fusion. Because the CNO cycle is very temperature sensitive, the energy generation is heavily concentrated at the center of the star, which results in a convection zone about the core. This results in a steady mixing of the hydrogen fuel with the helium byproduct of the nuclear fusion. Many B-type stars have a rapid rate of rotation, with an equatorial rotation velocity of about 200 km/s. Spectral objects known as "Be stars" are massive yet non-supergiant entities that notably have, or had at some time, 1 or more Balmer lines in emission, with the hydrogen-related electromagnetic radiation series projected out by the stars being of particular scientific interest. Be stars are generally thought to feature unusually strong stellar winds, high surface temperatures, and significant attrition of stellar mass as the objects rotate at a curiously rapid rate, all of this in contrast to many other main-sequence star types. Though the related terminologies are confusingly ambiguous, spectral objects known as "B(e)" or "B[e] stars" are distinct from Be stars since said B(e) entities are in possession of distinctive neutral or low ionization emission lines that are considered to have 'forbidden mechanisms', something denoted by the use of brackets or parenthesis. In other words, these particular stars' emissions appear to undergo processes not normally allowed under 1st-order perturbation theory in quantum mechanics. The definition of a "B(e) star" can include objects that are large enough to be in Blue giant and Blue supergiant territory, beyond the size of standard main-sequence stars. The revised Yerkes Atlas system (Johnson & Morgan 1953) listed a dense grid of B-type dwarf spectral standard stars, however not all of these have survived to this day as standards. The "anchor points" of the MK spectral classification system among the B-type main-sequence dwarf stars, i.e. those standard stars that have remain unchanged since at least the 1940s, are upsilon Orionis (B0 V), eta Aurigae (B3 V), eta Ursae Majoris (B3 V). Besides these anchor standards, the seminal review of MK classification by Morgan & Keenan (1973) listed "dagger standards" of Tau Scorpii (B0 V), Omega Scorpii (B1 V), 42 Orionis (B1 V), 22 Scorpii (B2 V), Rho Aurigae (B5 V), and 18 Tauri (B8 V). The Revised MK Spectra Atlas of Morgan, Abt, & Tapscott (1978) further contributed the standards Beta2 Scorpii (B2 V), 29 Persei (B3 V), HD 36936 (B5 V), and HD 21071 (B7 V). Gray & Garrison (1994) contributed two B9 V standards: omega For A and HR 2328. The only published B4 V standard is 90 Leonis, from Lesh (1968). There has been little agreement in the literature on choice of B6 V standard. Some of the B-type stars of stellar class B0–B3 exhibit unusually strong lines of non-ionized helium. These chemically peculiar stars are termed helium-strong stars. These often have strong magnetic fields in their photosphere. In contrast, there are also helium-weak B-type stars with understrength helium lines and strong hydrogen spectra. Other chemically peculiar B-types stars are mercury–manganese stars with spectral types B7-B9. Finally, the aforementioned Be stars show a prominent emission spectrum of hydrogen. 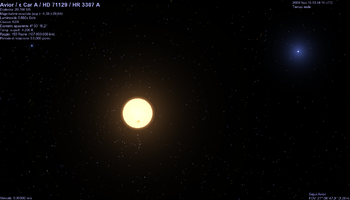 B-type stars known to have planets include the main-sequence B-types HIP 78530 b, the subgiants Kappa Andromedae b and a few (19 are now known) B-type subdwarfs. ^ Silaj, J.; et al. (November 2014), "The Hα Profiles of Be Shell Stars", The Astrophysical Journal, 795 (1): 12, Bibcode:2014ApJ...795...82S, doi:10.1088/0004-637X/795/1/82, 82. ^ Habets, G. M. H. J.; Heintze, J. R. W. (November 1981). "Empirical bolometric corrections for the main-sequence". Astronomy and Astrophysics Supplement. 46: 193–237. Bibcode:1981A&AS...46..193H. , Tables VII and VIII. ^ SIMBAD, entries on Regulus and Algol A, accessed June 19, 2007. ^ Pickering, Edward Charles (1908). "Revised Harvard photometry : a catalogue of the positions, photometric magnitudes and spectra of 9110 stars, mainly of the magnitude 6.50, and brighter observed with the 2 and 4 inch meridian photometers". Annals of the Astronomical Observatory of Harvard College. 50. Bibcode:1908AnHar..50....1P. Retrieved 2009-09-21. ^ a b Gray, C. Richard O.; Corbally, J. (2009). Stellar Spectral Classification. Princeton University Press. pp. 115–122. ISBN 0691125112. ^ Morgan, William Wilson; Keenan, Philip Childs; Kellman, Edith (1943). An atlas of stellar spectra, with an outline of spectral classification. Chicago, Ill: The University of Chicago press. Bibcode:1943assw.book.....M.
^ Aschenbach, B.; Hahn, Hermann-Michael; Truemper, Joachim (1998). Hermann-Michael Hahn (ed.). The invisible sky: ROSAT and the age of X-ray astronomy. Springer. p. 76. ISBN 0387949283. ^ Böhm-Vitense, Erika (1992). Introduction to stellar astrophysics. 3. Cambridge University Press. p. 167. ISBN 0521348714. ^ Slettebak, Arne (July 1988). "The Be Stars". Publications of the Astronomical Society of the Pacific. 100: 770–784. Bibcode:1988PASP..100..770S. doi:10.1086/132234. ^ Gray, Richard O.; Corbally, C. J. (2009). Stellar Spectral Classification. Princeton University Press. pp. 123–136. ISBN 0691125112.